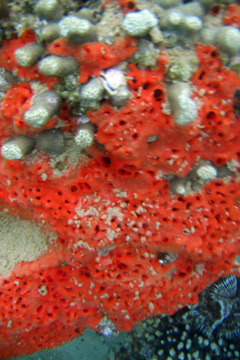 Mycale armata, a bright orange sponge that is native to Indonesia, is growing on finger coral in waters just off Kaneohe Bay near Coconut Island. An invasive species of sponge appears to be smothering native coral in Kaneohe Bay, a Bishop Museum zoologist has confirmed in a year-long study. People who live and work around Kaneohe Bay have said that Mycale armata, a bright orange sponge that is native to Indonesia, seemed to be expanding there in recent years, Steve Coles, a Bishop Museum marine invertebrate zoologist, told a group of wildlife biologists and managers Thursday. The sponge was first identified in Kaneohe Bay in 1996, he said during a research presentation at the University of Hawaii's Institute of Marine Biology. Between 2004 and 2005, Coles and research assistants surveyed the bay and learned that while the sponge is not widespread in the bay as a whole, it does account for about 5 percent of what is growing on the bottom in some areas near Coconut Island. Coles said the sponge is growing over colonies of both key reef-building species of coral for that area: finger coral (Porites compressa) and rice coral (Montipora capitata). In addition to mapping where the sponge is found, Coles did experiments to see how quickly it grows and whether it will grow back if removed from coral. The answers were not exactly good news. Untouched growths of the sponge on coral increased 13 percent in size over a year. But on other patches of coral where the sponge had been completely removed, it grew back over an average of 10 percent of the cleaned coral. Research assistant Holly Bolick said getting the sponge off the coral with butter knives, forceps, tongs and paintbrushes was "kind of like trimming a bonsai tree, but it didn't look as pretty." If additional testing over the coming year confirms that rate of re-growth, it will not be worth the struggle of hand-removing it, Coles told his fellow scientists. That worries UH coral reef biologist Cindy Hunter, who is working on ways to remove invasive algae that also is killing coral in Kaneohe Bay. "It's like a one-two punch," Hunter said after hearing about Coles' study. "Algae typically smothers from above and Mycale comes from below," she said. Hunter said she is particularly concerned about her observation that the sponge not only kills the living coral animal, but also appears to weaken its calcium carbonate skeleton. That is the stony part of the reef that provides habitat for other marine creatures. UH coral reef biologist Greta Aeby said the fact that the sponge is only found in the central and southern parts of Kaneohe Bay is somewhat encouraging. "He's not finding a widespread, overwhelming problem," Aeby said. "But it is a problem in Kaneohe Bay. It is there, and it is out-competing some of the coral." Coles' study was funded by the Hawaii Coral Reef Initiative.